You’ve seen something you like on our website, but you want to see and touch it in person, and look at what else we might have before spending your hard earned cash. We get you. Online shopping is good, but sometimes it’s not the same as seeing, touching and smelling our furniture in person. The only trouble is, you live miles away. Here’s an idea: why not combine a visit to see us with a day trip to Brighton (or even a whole weekend) and spend some time in this hub of food, culture, and all things fabulous? Read on for our insider’s guide to the best places to park, where to eat, and what to see and do while you’re here. • In the immediate vicinity to our shop and on the same street, are a plethora of independently owned shops including clothes, children’s wear and toys, a good Oxfam bookshop, a beauty salon, cafes, fish n chips, and a DIY shop that has everything you could ever need. • Hove’s pedestrianised George Street is round the corner with lots more cafes, a couple of pubs, and plenty of other shops. • The sea is just a 10 minute walk away. • The centre of Brighton, with its boutiques, cafes, restaurants, quirky alleys and buzzy streets is a 10 minute bus ride or 30 minute walk away. • Our Top Tip: take the train, Hove station is 10 minutes walk away and we can deliver to anywhere in mainland UK. • If you do drive, follow the signs from the A23 to Hove: at weekends the main roads into Brighton are often jammed, which can make for a stressful journey. The roads into Hove are much clearer. 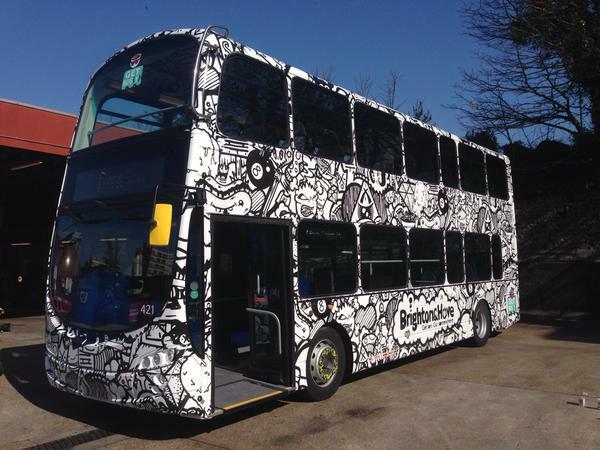 • Buses around the city are pretty good – a centre fare (which starts at Hove Town Hall) costs £2 one way, a day saver for unlimited bus travel in the city is £5. Download the bus app and buy tickets on your phone for cheaper fares. • Walking into Brighton along the seafront takes about 30 minutes. Glorious when it’s sunny. • How about renting a bicycle for the day? Cycle Brighton (close to Hove station) hire out good bikes, with rates from just £10 for 3 hours. • It’s meter parking in our street for £1 per hour, 2 hours max. • Tesco’s car park is just a few minutes walk away with 2 hours free ‘for customers’ – they don’t seem to check whether you buy anything. • Waitrose on Western Road (closer to the centre of town) – park here for free for 90 minutes when you spend £10 with them. • Have a look at parkopedia.co.uk – they have advice on where to park and how much it costs, including private parking spaces you can hire. • Hidden Pantry – directly opposite, with good quality, organic, free range lunches from £4.95. Tell owner Malik you came via JUGs and he’ll give you a 10% discount. • First Cup – just opened, a few doors along from us. Big portions good prices. Russ says highly recommended for sandwiches and salads. • Treacle and Co – the best cakes in Hove, opposite the big Tesco’s. Indulgent homemade yumminess and friendly service. 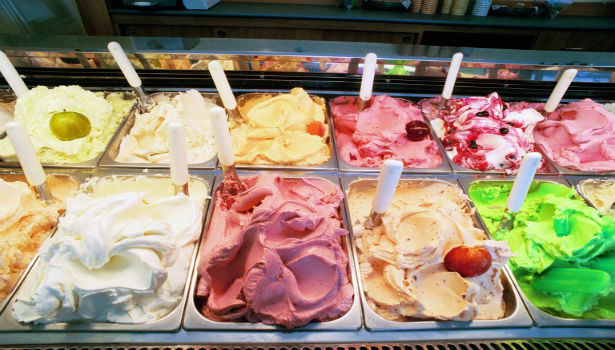 • Marrocco’s for ice cream on Hove seafront – the best in the city. Watch out for queues on the weekends though! 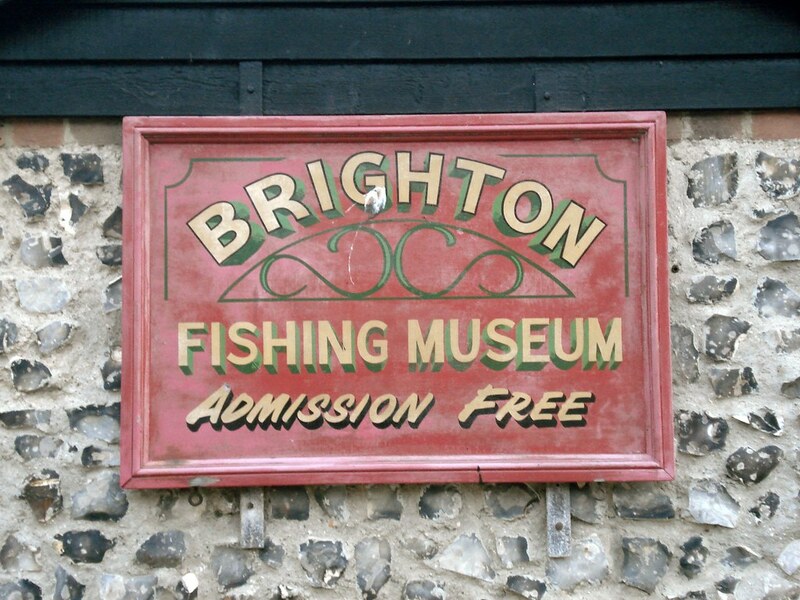 • Brighton Fishing Museum Café (next to fishing museum between the piers) – run by Rob, our friend, surfer and sometimes JUGs shop assistant. Say we sent you and get a free chai latte when you buy a slice of his award winning cake. • The Meeting Place – outdoor seating right on the seafront, next to the Peace Statute that marks the old boundary between Brighton and Hove. • The Dorset – a busy, friendly pub in the heart of the North Laine. • Small Batch – an independent business, there are a few around now, the closest is near Hove station, or on Wilbury Road. There’s one right in the centre of Brighton too. • Moksha – opposite St Peter’s Church, a hang out for local creative types. • Marwoods – a hidden gem in the Lanes. Quirky and amusing décor that changes often, with outdoor seating at the back and good coffee. 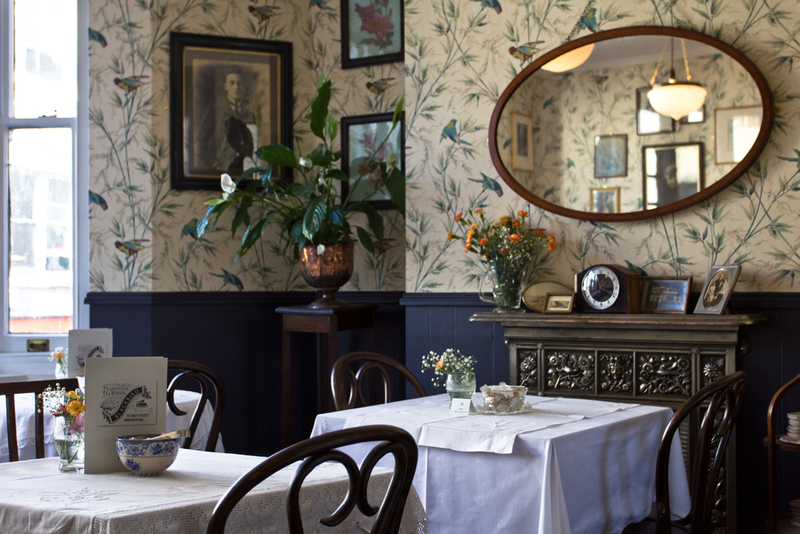 • Blackbird Tea Rooms – for a lovely vintage style cream tea in the heart of the North Laine. Brighton has a big choice of places to eat for all budgets in a small area, so if you want a good lunch or dinner, whatever you want, you’ll be spoiled for choice. • Giggling Squid – great Thai food in central Hove. • Othello’s – a local family friendly Italian pizza place. • Modelo Lounge – relaxed, big tables, very reasonable varied menu with meat, gluten free and vegan options. • Curry leaf Café – good Indian food with a modern twist, there’s one in the Lanes, and one inside the Temple Bar (near Waitrose). • Planet India – family run, authentic Indian food. It’s vegetarian but if you’re a meat eater, don’t be put off by that: the food is really good. Great value. • Indian Summer – for south Indian food in a smart setting, in the heart of the Lanes. • Iydea – good veggie lunches, in the North Laine. 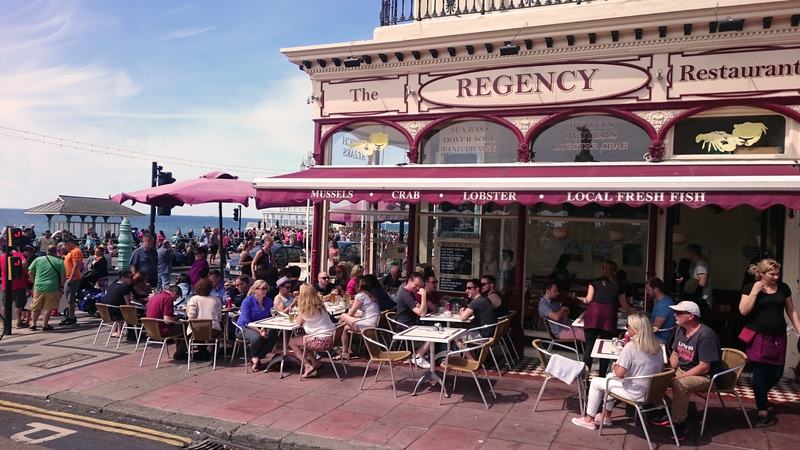 • The Regency – for great fresh fish and chips. Reputed to be Rick Stein’s favourite restaurant in Brighton, right by the West Pier. • La Choza – popular and good value Mexican in the back streets of the North Laine. • Plateau – French small plate dining, with exquisite ingredients and one of the best wine lists in the city. • The Urchin – seafood gastro pub close to our shop, you might spot Russ in there at lunchtime. • The Foragers – also not far from us. Some of the menu is foraged, and the beer is good. • Lion & Lobster – popular busy pub with good food, good beers and good staff. • Fortune of War – right on the seafront. Sit in the window for the best view of the sea. Brighton & Hove is full of independent shops and boutiques that you won’t find anywhere else. • JUGs Furniture – the best shop in Hove, of course. • RUN – the best running shop in the area is next door – tell Kurt we sent you. • George Street, Hove – this pedestrian street is full of cafes and food places. Sit outside when it’s sunny. No cars make it pleasant. • Visit the North Laine for quirky boutiques, and the Lanes for jewellery, homeware, clothes and antiques, Julien Plumart’s French patisserie, and the now world famous Choccywoccydoodah for extravagant chocolatey deliciousness. Apart from food, drink, shopping, and just soaking up the atmosphere, there’s more! • The Seafront – from Hove prom to the new boutique shopping quarter by the i360, the basketball and volley ball courts, the sailing club, right up to the pier, the seafront is steadily improving. The sea is different every day and it’s a great walk. Bracing in winter and buzzing in summer. • Brighton Pier – full of arcade games and slot machines, but great views. No visit is complete without playing Dolphin Derby. • i360 – tallest viewing tower, it should be opening this year. • Sea Life Centre – check out the seahorses and the stingrays. • Pavilion Gardens – there’s a nice outdoor café, and performers and musicians play for your pleasure. • Royal Pavilion – Brighton’s iconic palace, beautiful inside especially the music room and the banquet hall. • Madeira Drive – throughout the summer, all sorts of vintage car and vehicle rallies happen at the weekends. • Brighton Marina – the largest marina in Europe, with lots of shops, cafes, and restaurants overlooking the boats. You could take a fishing trip or learn to sail. And if you fancy staying here for a few days, from sea views to roll top baths, make your stay at the seaside postcard perfect at one of Brighton’s many hotels or guest houses. • Blanch House – the original boutique hotel. Themed rooms. You might spot a celeb in the bar. • Pelirocco – Brighton’s original rock n roll boutique hotel. • Airbnb – there about 300 places to stay in Hove, often can be booked last minute from about £30 a night, though many have a 2 night min stay. And if we still haven’t persuaded you to visit, you can always ask us to send you more photographs of the pieces you like!